Schöne 2BR Condo Destin Beach - günstigen Preisen! Luxus-Eigentumswohnung Komplex mit allen Annehmlichkeiten, die man erwarten würde. An den schönen weißen Sandstränden und smaragdgrünen Wasser der Destin, Florida. Sie werden sich sicher fühlen, zu wissen, den Komplex mit 24 Stunden Sicherheit gated. Zu Fuß zu den größten Outlet-Einkaufszentrum im Südosten des Landes (Silver Sands), Restaurants und Supermarkt. Aktivitäten für alle Altersgruppen einschließlich Kinder-Programme während der Sommermonate. Great place to stay. Super clean and smelled nice. Didn’t bring a hairdryer because we stay 2 nights in Hotel prior to arriving. So we had to go around with wet hair. Also we had to rent our own beach chairs and umbrella which was $70 a day. This condo didn’t include. The pool was to cold to get in so the jacuzzis was over crowded. But slept well and had a very nice place to stay. I won’t come again in March. Ocean water to cold and had yellow flags the entire stay. Never thought about a hair dryer....but will put one in unit! Sorry about the weather and chairs. The condo was clean, quiet and comfortable with very easy beach access! Beach chairs, umbrella and kayak rentals were also available. The location was excellent with shopping and great restaurants nearby. This condo was super clean and comfortable. The location's amenities are kind of spread out. The heated pool is the opposite direction of the beach. The beach is very nice. You get chairs and an umbrella. We saw manta rays swimming off shore. Parking is close. We would have liked more towels for 5 nights and 4 guests. Very nice relaxing vacation spot. Close to restaurants and groceries. Beautiful condo. Spotless. Well equipped with everything we needed for our stay. Mainsail is a great condo destination. Everything you need and want is within walking distance: groceries, pharmacy, restaurants and an outlet mall. The grounds are beautiful. The beach was great and the beach attendants were wonderful. Mainsail is very family friendly and quiet. Had everything we needed. Had a great time. We would definitely stay here again. Mainsail complex is a great location. Close to everything you need. Only small complaint with the location of this unit is the archway that is there blocks the view of the gulf when you sit out on the balcony. 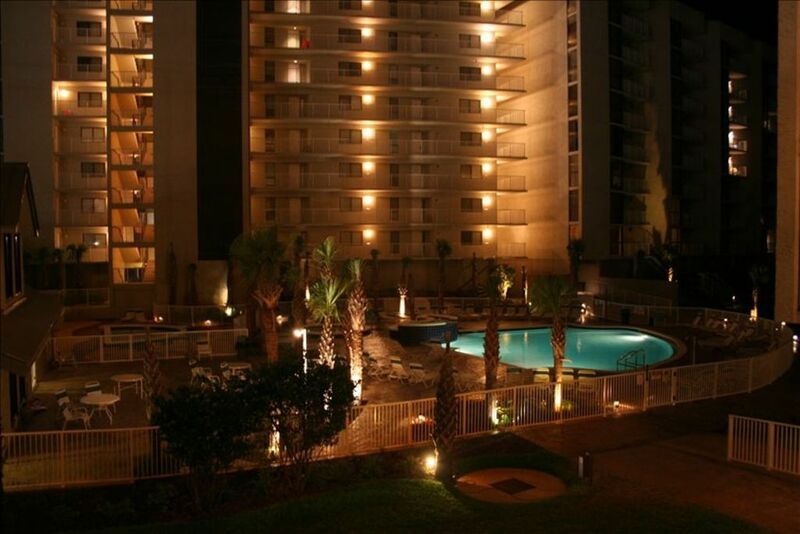 Had a great time at this condo in Mainsail. The condo was very clean and we would definitely return to stay at this unit. From July 1 - August 12 we only rent weekly (Saturday to Saturday) -- THE MONTH OF JUNE WE WILL RENT NIGHTLY -- BUT 4 NIGHT MINIMUM Sorry, but no pets are allowed. This is a no-smoking unit. No credit cards.